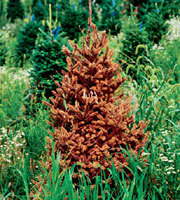 The Fraser fir is the ideal Christmas tree. Fragrant, strong-limbed, and long-lasting when cut, it has found its way to the White House's Blue Room more than any other tree over the past 50 years. It is also a vector to the most destructive plant pathogen you've never heard of. 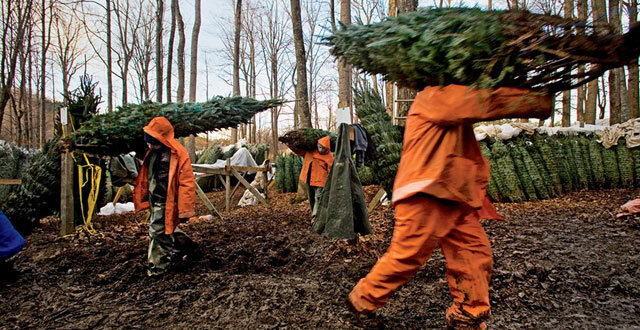 The shapely Fraser fir, a southern Appalachian native now farmed extensively in nurseries, is a common carrier (and victim) of Phytophthora cinnamomi, a deadly water mold wreaking havoc on ecosystems around the world. When infected Frasers are replanted, the disease gets an opportunity to spread to new farms and neighboring plant life. Originating in Papua New Guinea, soil-borne cinnamomi arrived in the United States at least 200 years ago via agricultural trade. The root-rot that it causes transformed the forests of the Southeast, killing huge numbers of American chestnut and shortleaf pine. Scientists didn't pinpoint it as the source of this dieback until 1948, by which time it was ubiquitous in the South. A cousin of the sudden oak death fungus devastating forests on the West Coast, cinnamomi now affects hundreds of plant and tree species on six continents. In recent decades it has marched westward, killing rare manzanita in California and native oaks in Mexico. It also thrives in avocado orchards, and in fact is the limiting factor in avocado production worldwide. "Cinnamomi continues to get worse. It shows up in new places and on new hosts," says Everett Hansen, an emeritus professor of botany and plant pathology at Oregon State University who's been studying the fungus for 30 years. Climate change may open up vast new regions to the pathogen, including in Hansen's home state. "There's evidence of cinnamomi becoming increasingly active in areas farther north than it has historically been present," he says. Note from the author, in response to some of the comments below: To those who have asked about risk from mulch and cut trees, Phytophthora cinnamomi is a water-borne fungus that thrives in wet soil and acts on the roots of the tree. Once cut, the tree is no longer a carrier of the fungus (which would remain in the soil and root system). The fungus is spreadable by transplanting live trees and by moving infected soil, whether with a tree or inadvertently (in pots, on truck tires, etc.). Cut trees and mulch of cut trees would not bear a risk of transmission. However, in the sense that increased cultivation of Frasers and other vulnerable species adds to the risk of the pathogen's spread, simply purchasing a cut Fraser can be said to potentially contribute to the problem.